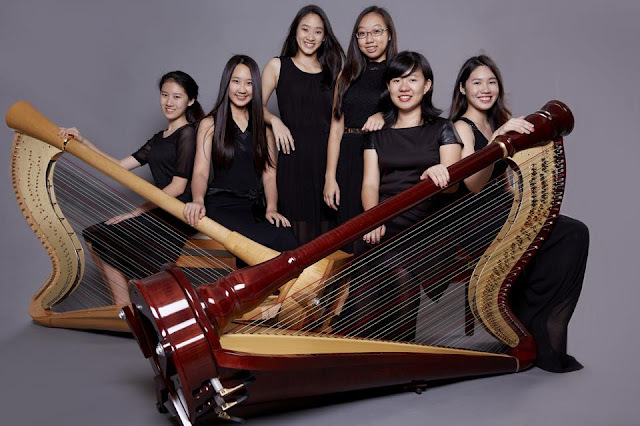 Established in 2014, VivaRave is an ensemble of harpists who have graduated from Katryna Tan's RaveHarps studio, and are currently pursuing professional harp studies in renowned conservatories around the world. These conservatories include the Juilliard School, Royal Academy of Music, the Royal College of Music, and the Yong Siew Toh Conservatory. Many of them are prize winners at prestigious harp competitions like the Nippon International Harp Competition (Japan), 1st International Harp Trophy for Young Talents, 1st and 2nd Thailand International Harp Competition, 6th Lily Laskine International Harp Competition and the Singapore-Malaysia Harp Competition. During their time in the RaveHarps studio, these harpists trained together as an ensemble and had the opportunity to perform at international events like the World Harp Congress (Sydney in 2014, Vancouver in 2011), 40th Ancenis International Harp Festival (France, 2012), Harp of the Orient (Malaysia, 2014) and ChildAid (Singapore, 2009). Their biggest project yet is the World Premiere of Pluck the harp musical at the Singapore Harp Festival (2013) which was a visual spectacle of drama, song and entertaining harp repertoire. VivaRave is passionate about displaying the versatility of the harp by playing works that pushes the boundaries of conventional harp technique. In addition, VivaRave commissions works by local composers such as Eric Watson, Joyce Beetuan Koh and Phang Kok Jun. These works have been performed locally and abroad and were well received by audiences. VivaRave aspires to continue performing such works overseas so as to exhibit ‘Singaporean’ music to international audiences. Most recently, they celebrated the 50th birthday of Singapore by leading an ensemble of 50 harpists to perform at the 2015 Singapore Harp Festival.